Good grapes make good wines, each year offering similarities but also differences. The harvest report is as important to us as our tasting notes. It reminds us of how we dealt with different or indeed similar challenges. It prompts us to reflect on the qualitative differences between the grapes and the resulting wines. It permits us to draw parallels and distinctions between the vintages. If nothing else, these records show the farming challenges of working with the vagaries of the English weather. • Harvest dates record the dates the grapes were picked. Bud burst comes in the main from mid-April to the first week in May. Flowering & fruit set generally comes in a window, centred on Wimbledon, from late June to mid-July. Véraison is mid to end August. Harvest comes any time from late September to late October; most commonly in the second week of October. All of these key points in the season are driven substantially by the cumulative pace of Growing Degree Days, the timing and quantity of rainfall & the cumulative number of Sunshine Hours. Optimists are saying that 2018 sets the benchmark for wonderful summers to come; the more cynical are already referring to it as a once in a lifetime result. Either way this year the grapes are breaking records with best-ever sugar levels and a cornucopia of quality and quantity. The gods have been smiling. For those focused on the impact of Global Warming: weather volatility was a continuing theme in 2018; from -11.7 Degree Centigrade night time lows at the end of February, to record summer highs of 34 degrees in late July; with an eight week drought thrown in through June & July. We recorded the highest number of Growing Degree Days (944 vs. a 784 average according to Viticulture App. Climate Vine) of the last decade; my local data suggested closer to 1050. It was also an exceptionally sunny growing season, 16% above the prior decade average (Eastbourne Weather station data). Rainfall was plentiful in April and May, but literally evaporated for much of the summer, rescued substantially by August downpours. For the entire April-September growing season it came in around the prior 10 year average. We planted 7500 (5500 Chardonnay & 2000 Pinot Meunier) vines on our final Great Gale parcel on May 30th. A 3 hour deluge descended 15 minutes after the last vine had been planted. Thereafter there was no significant rain until the last weekend in July. We resorted to hand watering the baby vines with a 1000 litre stillage strapped to the back of an ATV. The drought broke several days later with over an inch of rain falling. Bud burst came around 21-24th April. Chilly nights continued right into the second half of May, hovering just above zero on several nights. Average early April day time temperatures gave way to a heat spike in the second half of April. These high day time temperatures continued to build through May into June, culminating in an incredibly warm and sunny July. Those vines unaffected by the winter frost exhibited good vigour. Fruit set passed through quite rapidly at the end of June, amid dry conditions with gentle zephyrs: breezes just strong enough to dust the pollen over the vines and no rain to wash it off. Fruit-set was quick and even. The warm start to August gave way to more average temperatures and slightly cloudier conditions. September saw slightly above average day time temperatures, but with some quite cold nights. The Chardonnay and Pinot Gris got off to a very strong start. Inflorescences in all varieties were promising. The Upper High Field Pinot potential fruit load was lighter, but still substantial, while the main Hawk Field Pinot parcel showed great promise, with the exception of a rectangle at the top of the block which had suffered greatly from the exceptionally cold weather earlier in the year. We set about stripping fruit and applying further vine nutrition. Signs of drought stress emerged in the very vigorous Pinot Gris in early August, with all the vines showing signs of shutting down. However, the break of the drought and copious nitrogen and foliar nutrition, applied previously, saw vigour recover and the canopy improved a lot, necessitating quite challenging vine trimming and leaf stripping later in the month. Full veraison was achieved as we moved into the second half of August. The PInot noir was well ahead of the Chardonnay; partly as the latter had an exceptionally heavy fruit load. The Pinot Meunier sat midway between the two. The Pinot Gris ultimately delivered sugars in the 80s (Oeschle). Sugars rose substantially through mid September, such that we took a first pass, harvesting Hobdens & Hawk Field Pinot parcels in the pouring rain on September 22nd. This was the earliest harvest commencement date ever. Our concerns that the drought might have adversely impacted acids proved groundless. Sugars were exceptional and acidity perfect. Temperatures dropped considerably around the 24/25th and we found ourselves flirting with a very early frost. 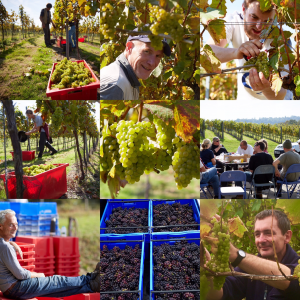 With the exception of the first day, harvest took place amid sunshine and dry conditions, broken by cold nights. Harvest Labour shortages meant that we had to execute a slow pick, press load by press load, between Sep 22nd and Oct 5th. Ordinarily that would be risky, but the weather was kind to us. 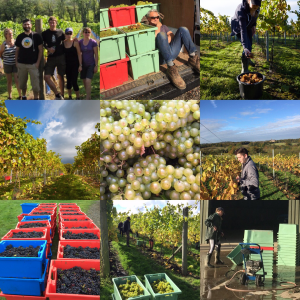 Harvest 2018 came to a successful conclusion with a final push to get the last 3.5 tonnes of Chardonnay out of the vineyard and into the winery. We could not have pulled it off without the support of friends, customers, local supporters and family, who pitched in to help bring in the crop. So: vintage 2018? Full of the promise of some really good wines, full of flavour, abundant and generous with enough acidity for elegance and balance. This year we haven’t just been picking grapes, we’ve been picking happiness. The English Sparkling growing season typically runs from the beginning of April to the end of October, with harvest in the East Sussex High Weald generally in early to mid October. But 2017 proved to be a season of extremes. We started with drought. March was unusually warm. Bud burst came forth 2-3 weeks early. As we moved into late April, the beautiful shoots were growing rapidly. But temperatures suddenly lurched lower. A succession of late month frosts did damage to many vineyards, wrecking their fruitful promise. April 28th saw one of the worst advection frosts in Kent, Sussex, Surrey & Hampshire for two decades. This laid waste to many vineyards, not just in Southern England but also in Champagne and Burgundy and as far south as Piedmont. The beautiful green and pink buds on the vines in our small 5 acre parcel below the house were completely destroyed. Even the secondaries were blitzed. No fruit would be forthcoming this year. Fortunately, our more open and breezy 25 acre plot 3 miles away was only modestly impacted; probably due to the openness of the site and the warming stream that runs along the bottom of the lower vineyard parcel. Frigid nights gave way to exceptional warmth and sunshine through June into early July. It was a near perfect flowering and fruit set. But then the deluges began; initially in the form of intense overnight thunderstorms accompanied at times by hail. Hail damage was relatively light for us, a few short showers impeded by a strong canopy, but it still left its mark on some bunches right up to harvest. Temperatures drifted lower through August into September as drought and intense sunshine gave way to wetter more mixed conditions. Nevertheless, Véraison came earlier than usual in the Pinot Noir & Pinot Meunier; the Chardonnay progressing at a more sedate pace. The Sugars in the grapes rose steadily, but acids remained quite elevated as we moved through September. The projected date window for harvest came forward from mid October to the first week, then back to mid October and then finally forward again; acids fell quite rapidly and rather unexpectedly from elevated to much more manageable levels, but more importantly the fruit flavours were good. Early October rain threatened as the remnants of Gulf storms made their way in our direction. We found the stars aligning for an end of September harvest. Bunch weights were good; partly a function of the quenching rains that followed the early year drought. Growing Degree Days had been running well above decade averages, but began to drift back in the cooler wetter August/September conditions. They were similar to the excellent 2014 and 2016 vintages. Rainfall for the season was well above the prior decade average, similar to 2014. The clincher we think was sunshine hours. These were on a par with 2009, 2010 and 2011. The base wines showed exceptional promise as we blended pre second fermentation. 2016 was an atypical, but ultimately superb quality, vintage & growing season. A rain-soaked winter gave way to a cool but dry late spring. Late frosts were a menace that we managed to dodge. Many producers were forced to race around their vineyards at night lighting bougies & using tractor hauled hot air machines to protect their vines. Fruit set was mixed, due to wet weather, particularly challenging in the Pinot Noir, but much more even in the Chardonnay & the Pinot Gris. Then the warm & sunny weather came, which was a mercy. It was a glorious summer. Vineyards across the South were then wrong-footed by a particularly persistent outbreak of Downey mildew. The further west you went, the worst it seems to have been. We managed to successfully hold it in check. Véraison came about 7-10 days early, but we stuck with our plans for a mid-October harvest. Nevertheless, sugars rose very fast as September gave way to October & we decided to bring things forward by a week. The birds were showing way too much interest in our Pinot Noir & Pinot Gris & we wanted to preserve the acids. The Starlings & hedgerow birds were extracting a greater tribute than they normally do, although the Hawk kites that we deploy annually & the ever-present Buzzards kept them on edge. We had great picking weather & some lovely fruit. Yields were substantially below average, but the fruit flavours, sugars & acids were really quite super. They will make some exceptionally good fizz, albeit in relatively modest quantities. Bud burst came slightly early in the middle of April. A slightly cooler May slowed things back to about average. The fruit load looked promising. A relatively dry period ensued, with the formation of good bunches & the additional warmth spurred growth. However, fruit set although optically even occurred over a longer period than usual, with marked differences between & within our 5 main vineyard parcels. A function of wetter conditions. The grass growth, that had us mowing in the tractor every weekend, slowly eased with the very limited rainfall through the end of July into early August, but the the task gave way to “canopy management”, tucking in unruly wind-swept vines; this was one of the windiest summers on record. The whole summer seemed to be a succession of mowing, strimming & vine trimming. The humid & wet end to August slowed things down again. The High Field Pinot Noir showed signs of the windier weather and, being predominantly on free draining Greensand, lack of summer rainfall. This manifested in decent fruit load on these younger vines, but limited cane development, presenting a pruning challenge for next year. The more sheltered Hawk Field growth remained very good, while the vineyard at Hobdens, from whence Mayfield Expression Brut Rose comes, with its denser water retaining clay, positively thrived; benefitting no doubt from the generous composting that it received earlier in the year. Late August rains that doubled what we had received in the prior four-and-a-half months proved beneficial on balance, allowing the berries to swell in a favourable manner & removing some early signs of drought, while much of the excess water ran-off the ultra-dry soils into the many streams that surround us. The year also saw several pairs of Buzzards take up permanent residence at both vineyard sites. Their mewling cry as they swooped & rose on the thermals over the vineyards was a joy to behold. It also deterred some of the smaller berry eating birds. The Hobby, en route from Northern Europe back to Africa for the winter, also joined us again. If the deluge had ended with August, it would have been a textbook year. We all hoped for an Indian Summer through September & early October. However, this failed to fully materialise. Temperature levels were about average, but rainfall picked up again & sunlight levels were not optimal. The pace of ripening slowed markedly. The longer period of fruit set from earlier in the summer began to become apparent as some parcels moved ahead of others. Véraison emerged at about the same time as last year, but it was very slow & uneven. We set about lightening the fruit load in the Pinot Noir by “colour stripping” unripe green bunches, forcing the ripening into the colouring clusters. Our oldest parcel of vines that sit on clay at Hobdens were the most even and advanced & we harvested them first on October 16th. They yielded possibly the best quality fruit that we have ever seen from that vineyard, with loads similar to the bumper 2014 crop. The fruit load on the main Chardonnay parcel at Lakestreet was excellent, offering fine fruit flavours, albeit with slightly lower sugar levels than usual, while the Pinot Gris load was lighter than in previous years. The Pinot Noir parcels were mixed, but the ripe bunches offered great flavours. We elected to undertake a selective pick of the Pinot Noir vine by vine sub parcel by sub parcel & pressed in the winery more lightly than usual. In effect, we sacrificed volume for quality. The result was encouraging: base wines with excellent fruit flavours & manageable acids, offering potential for wines of above average longevity. The growing season commenced after the wettest winters for over a century, with rainfall at +265% of the long-term average; it’s an understatement to say it rained. Fields were super-saturated, but the soils stayed warm. No snow fell, there were few frosts. Just wet, wet, wet. March and April were warmer than average, drier and sunnier; a much needed respite from the wettest winter since records began. Bud burst came around mid April. May was simply spring like, a little cooler, showery, one or two days of proper rain. June started well. Flowering and fruit set followed in rapid succession, with perfect bunches resulting. A long dry sunny warm phase unfolded right the way though August; the vines able to draw on the retained moisture in the predominantly clay soils. Véraison came slightly early. September was warm and predominantly dry. We planned on a harvest date in the second week of October. However, late September/early October saw cooler wetter conditions prevail and acids began to fall quite rapidly. We brought harvest forward by a week. Although this was one of the wetter growing seasons, it was also one of the more sunny and with the highest Growing Degree Day totals to-date. The bunch weights were exceptionally good, contributing to one of the best crops in many years, & fruit flavours were simply luscious. We started the year shivering and coated in mud as chilly winds and heavy rains blew over us. The season got off to a miserable start: cold, wet and disheartening with vine growth lagging by a month as we reached May. But, mercifully, May was magical: warm and dry with stable high pressure and that’s the way the weather stayed until September. Véraison came only slightly late as the grapes caught up. But hopes of an Indian summer were dashed by cooler temperatures and, by mid October, worrying storms were forecast for the month end (the St Judes’ Day storm). That pushed us to pick in the last week of October. We ended the season as we began in torrential rain and howling winds just after the crop was safely in. Although not a warm vintage, we benefitted from good sunshine hours. This was the year of Pinot noir – with exceptional flavours in the fruit. The Pinot Gris also produced very good quality grapes. These were the first vintages of our Award Winning Tradition Brut Blanc de Noirs and our avant-gard Pinot Gris based cuvée Inspiration Brut Blanc de Blancs, sparkling wines. This year was a year of weather frustrations and failure. We started with a March drought, having to water the young vines in our High Field (Lakestreet). The vines were growing like Topsy until April 1st when they stopped in their tracks with the arrival of three months of chilly, damp “bank holiday weather”, broken only by the one warm week in May (for the Queen’s Diamond Jubilee). August was average, while the autumn was cool and grey. We needed another two weeks of growing time as we headed towards November which is not a month associated with good plant growth. We made a decision not to harvest. That was tough. 2011 was the year of great Chardonnay for us, both in terms of quality and quantity. The red grapes were soaked by rain at flowering, so we lost half the potential fruit load through lack of pollination. The Chardonnay, however, flowered earlier in the warm dry days of early May, thanks mainly to a very summery April amid an 8 week period of cloudless skies and beaming sunshine. We picked the Chardonnay later than most of our neighbouring vineyards, as the load was significant requiring longer to reach perfect ripeness. We risked the possible drop in acid levels by letting the fruit hang until the end of October to get the natural sugar levels up. Nevertheless, the gamble paid off, with a heavy load of clean ripe fruit, with perfect sugars and acidity, as reward. The red grapes were delivered to the winery, a week later still, in perfect shape: an even bigger gamble in some respects. This outstanding Chardonnay harvest allowed us to make our first Blanc de Blancs. The smaller fruit load on the Pinot Noir & Meunier, a consequence of the poor fruit set, had provided a natural green harvest which, combined with the very late harvest, allowed good ripe fruit to be delivered to the winery. Emboldened by the high quality of the red fruit, we produced an almost entirely Pinot-driven dark rosé, with a hint of oak age, now in the cellar and named: Mayfield Midnight. This was a roller coaster year where growing conditions were at times brilliant and at others extremely challenging and where a degree of strategic decision making and risk taking made the difference between a great crop and a very mediocre one. We started on the back-foot with late bud-burst due to the chilled, snow laden winter. Then came a prolonged sunny and eventually warm period over the early summer, with 12 weeks without rain, which brought the vines from 3 weeks behind 2009’s growing pace to “on a par“ by early August. Then came the coldest, wettest August for a hundred years. Growth slowed. October was warm and sunny and we ended the season picking just as the first frosts arrived. This was the year the vines pretty much just grew themselves. After a snowy winter, the growing season started with a long dry spring, 8 weeks without rain. A normal July followed with weekend rains and sunny weeks. Next came a dry and sunny August, rain in early September as the fruit began to swell, warmth into October. We recorded temperatures of 18°C on October 1st and that set the scene for a gentle Indian summer that carried us through to an early harvest.